In the spring, many people will find grubs in their lawns (or the skunks and raccoons find them and leave a big mess.) The good thing is that the skunks are getting rid of the grubs. If you could just teach them to put the grass back after they have taken the grubs out, I’m sure we could hire them out as grub eradicators. Generally speaking, we wouldn’t recommend trying to treat for grubs at this time of year. And why not? First of all, most of the damage grubs do to your lawn is done in the fall. By spring, they are not feeding very much. In a few weeks, the grubs will pupate, and then turn into adults. The adults then fly around, mate and the females lay eggs on lawns. The cycle then starts all over again. Secondly, at this time of year a grub treatment is generally not worth the cost. 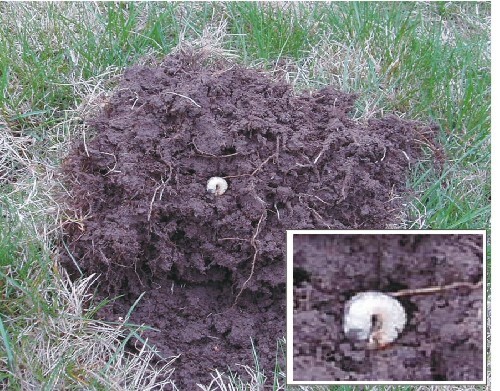 The products available to control grubs do not work as well in the spring. The grubs are bigger and need more insecticide to control them. We have been testing a liquid spray product to repel the digging animals. Please call for pricing on this treatment. Controlling the grubs in the spring is good for your neighbourhood, but not necessarily for your lawn. If there are fewer grubs in your lawn now, there will be fewer adults flying in the neighbourhood. But since the adults can fly, even if we were able to get rid of all the grubs in your lawn in the spring, it doesn’t mean that the adults from down the road or across the street won’t fly over this summer and decide to lay their eggs on your lawn. Helping out the neighbourhood is great for everyone in the neighbourhood, but not necessarily for your lawn. And since you are the one paying for the treatment, we recommend doing what is best for your lawn. The first task is to fix the grub damage. Feed the lawn to improve its health. Add seed to the areas that are damaged to fill in the bare spots. Then we recommend that you consider an application of Grub treatment this summer to protect your lawn from the next generation. The eggs laid in the summer turn into “baby” grubs. Baby grubs are the dangerous ones. They have to get fat enough to survive the winter. So they feed on grass roots all fall. This is when the greatest damage is done to your lawn. Currently in Ontario, the only option is to apply Nematodes to your lawn during August-September. Nematodes are microscopic worms that attack the grubs. When they enter the grubs, they give off a toxin that will kill the grubs. The nematodes multiply within the grub's body cavity and then go off searching for more grubs. Nematodes, being living organisms, need to be handled with care. They also need lots of moisture so that they do not dry out and die.